I like that along with learning about the potential of the peer-to-peer Distributed Web concept in our EL30 course, with Stephen Downes, he is also providing us with ways to engage with the DWeb concept. 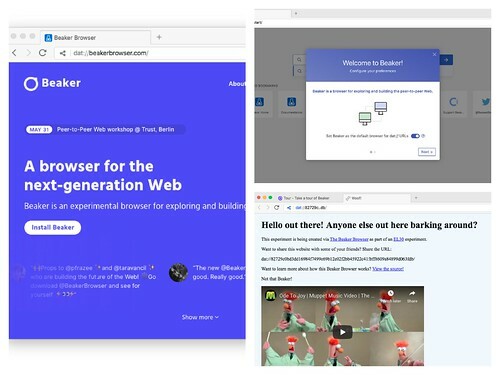 One of his suggestions is to use the Beaker Browser, which is a peer-to-peer browser using a technical underpinning called ‘dat‘ and which allows you to quickly and quite easily make and publish a website within minutes. The Web enabled communication, collaboration, and creativity at a scale once unimaginable, but it’s devolved into a landscape of isolated platforms that discourage customization and interoperability. The Web’s value flows from the people who use it, yet our online experiences are dictated by corporations whose incentives rarely align with our own. You can view the simple site I made on Beaker, which is mostly html-based with a few tweaks. However, because Beaker runs off the peer-to-peer computing power, my browser will have to be up and running, and accessible from the Beaker dat network for you to view the site I made (that’s the peer-to-peer computing element). This is one drawback of peer-to-peer, as far as I can tell. Another issue is that the ‘dat’ protocol doesn’t run in any other browser, other than Beaker. Which makes sense, since the peers are sharing the networking power. So the link down below to my site is one you would have to first copy and paste into a Beaker Browser, which is free and easy to download and use. 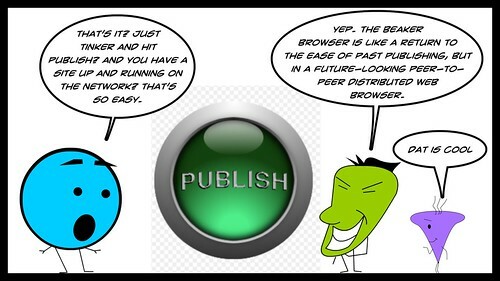 The Beaker Browser also functions like a regular browser, but is a Distributed Web platform. What this means, if I understand it, is that there is no central server — the networking power and protocols are shared across users of Beaker itself. This need for Beaker to view sites is a second drawback. Also, my blog platform here clearly does not like the ‘dat’ file at all and likely sees it as insecure. Every time I try to force it be a link off this page, Edublogs tries to wipe it clean or remove any linking whatsoever. It’s just not ready for Beaker. Playing nice across platforms and hosting services is a third drawback. The folks at Beaker have a simple tutorial with screenshots on how to do this, and then Stephen also does a nice job of explaining what Beaker is and how it works, and how you can get started. Even with the three drawbacks of Beaker that I noticed — Beaker has to be up and running for anyone else to use and access its shared computing power, Beaker is the only browser to recognize and launch dat files, and platforms don’t recognize dat links as secure — I like where Beaker is going within the Distributed Web, and I am glad to have learned about it by using it in EL30. 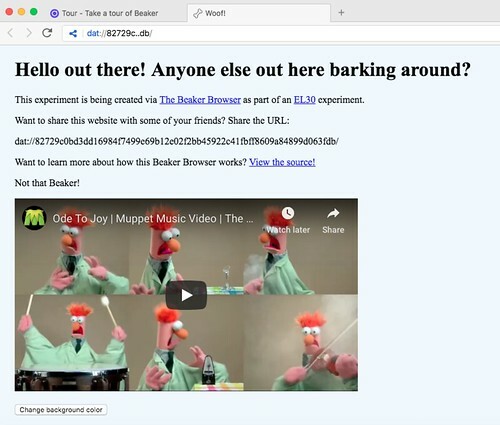 The people working on Beaker call it experimental, and it is quite likely that what I see as drawbacks now might actually be key advances in browser functionality down the road. This entry was posted in EL30, Technology Resources. Bookmark the permalink. Enjoyed reading your insights into this and I like the new Beaker site! You make an important point that our browsers will need to be kept running in the background for the .dat sites we create to be accessible and visible to others. If I want to put more work into my .dat site and keep it reliably available for people to access and view when I’m not online I probably need to consider sharing it with a peer-to-peer host, like Hashbase (https://hashbase.io). Could not get your dat address to load in my Beaker browser. Hmmmmm. That’s ’cause my Beaker is not launched when you looked. One of the weaknesses (for now): I have to be up when you are up in order to allow you access to my work.